- visited 13 cantons out of 26. - Stayed in 6 hotels during 14 nights. Here is the map of our route. Blue was explored by boat, orange by postal bus, red by train. Our journey is getting close to an end. Today we got on the Bernina Express towards Chur. 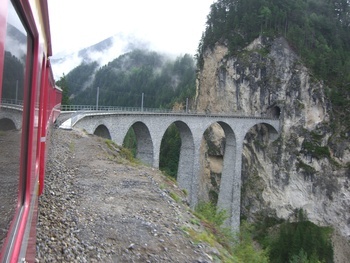 We cross once more the picturesque valleys and the amazing viaducts. In Chur we changed to another train to Zürich. It was like getting back to civilization to arrive to the busy main station of Zürich. Here we took a regional train to Kloten, which is the small town outside of Zürich, where the airport is situated. We stayed in Welcome Inn, great hotel with very friendly staff and with free shuttle service to the airport. 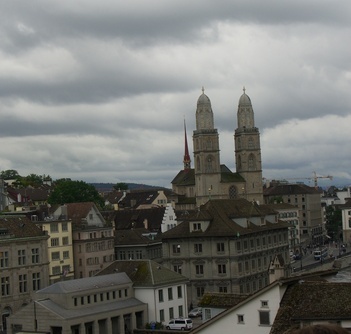 We enjoyed a free afternoon, when most of us ventured into Zürich, which is only 15 train ride away. We strolled the busy downtown area, where a fair was taking place. Our last meal was in the hotel which had to include the local specialty - Rösti - which is similar to hash brown. We boarded the Bernina Express in St. Moritz, which is celebrating this year it s one hundred year anniversary. 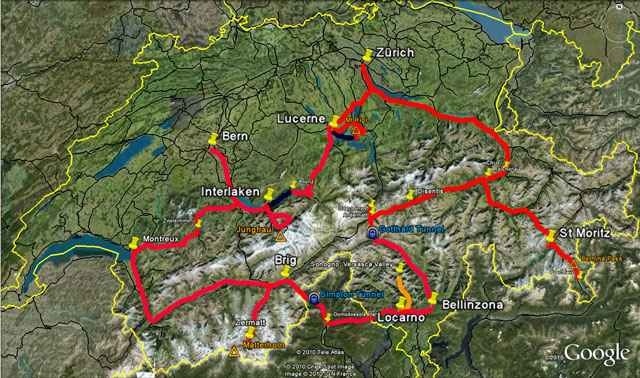 The total length is 122 km passing through 55 tunnels and 196 bridges and viaducts between Chur (the capital of the canton) and Tireno, which is in Italy with a extension line to Davos. It is part of the World Heritage Site. 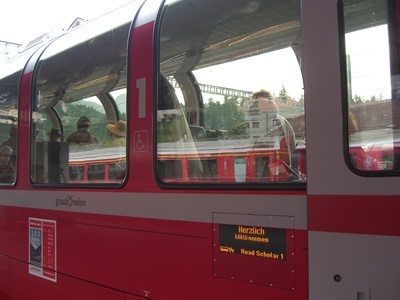 You might can spot the Herzlichen Wilkommen Road Scholar sign on our first class reserved carriage. 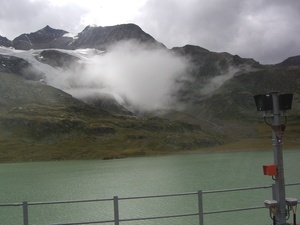 We passed some glaciers and we reached the highest point of our Journey the 2253 m (7391 ft) Bernina Pass. The weather was very dramatic and quite chilly outside, so we did not feel sorry that we were not accommodated in one of the open carriages what is very special and you need to make arrangements far in advance. 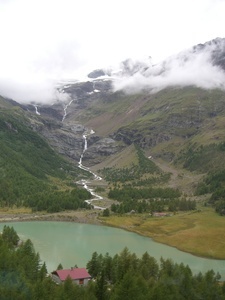 The Bernina Pass is a natural water shed, water from the northern side goes to the Danube then to the Black sea. Water on the south goes to the Adriatic. 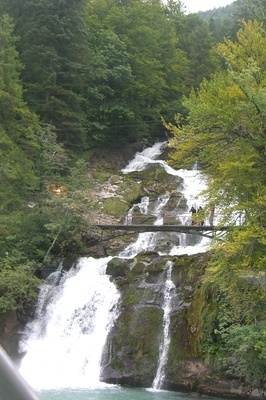 This waterfall will end up in the Adriatic, since we crossed the pass. 6 trains in one day! We can do it after practicing for 2 weeks. We started out quite early this morning with putting our luggage into a van, which was highly appreciated. 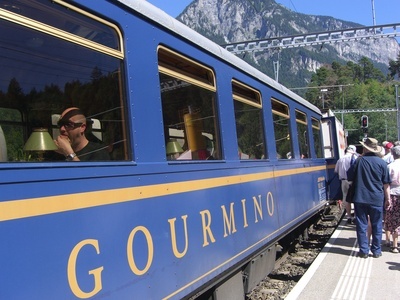 Then we took the “usual” train to Bellinzona, then we change to an Intercity to Göschenen. This ride took about 1 hour and we went through 2 sets of spiral tunnels. When we entered we were in the valley when we came out we seen the same valley from above. Then we crossed the “old” Gotthard Tunnel which is 10 miles long and the trains are going in the same tube here (in the new one there will be separate tubes). 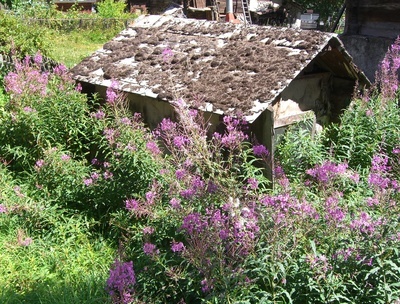 The first picture is a hay drying small barn, which can be found all around the hills far above the settlements. 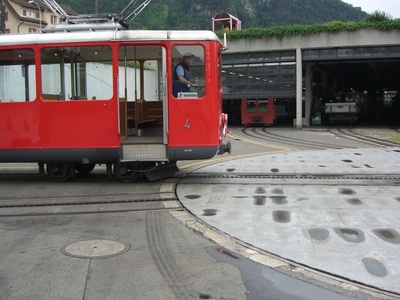 We changed in Göschenen for a cogwheel railway to “climb up” to Andermatt in about 10 minutes. 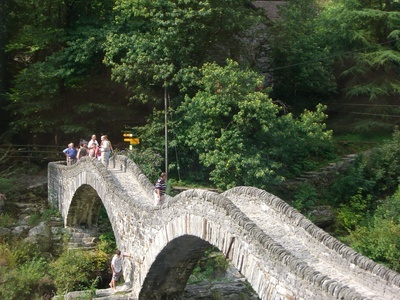 During this trip we have seen the so called Devil’s bridge which connects the two sides of the gorge and that was the most difficult part to cross in the middle Ages. 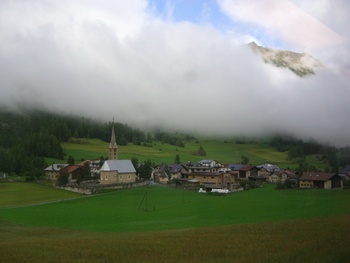 We changed again in Disentis, where you can find a Benedictine Abbey founded in 720. 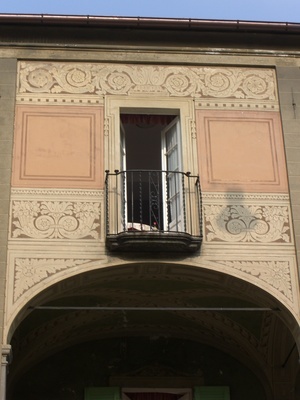 (The present building is from the 17th century). From here we followed the Rhine Valley, it has several forks. 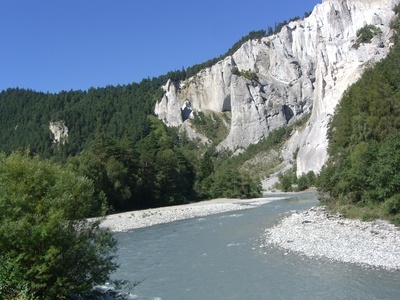 The Vorderrhein what we followed had to cut through a prehistoric landslide. 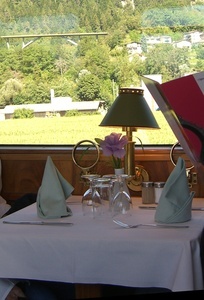 In Reichenau we boarded a historical dining car which took us along the beautiful valleys. It was a really special atmosphere to enjoy lunch on the train. The trains in this area are operated by a local company: Rhaetische Bahn similarly to other smaller companies but our rail pass is valid here as well. 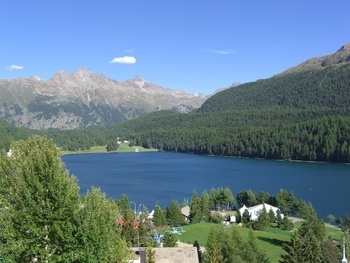 Eventually we arrived to the world famous St. Moritz where we checked in to Hotel Soldanella. An oldie-worldly gem with an amazing view over the St. Moritz lake. The town is situated 1855 m (ca. 6000 ft) and is one of the most famous winter resort in Europe. In the afternoon we had a lecture on the Graubünden Canton – which is the largest in Switzerland. 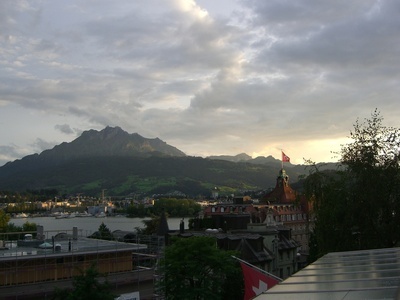 The canton only joined the Swiss Confederation in 1803. 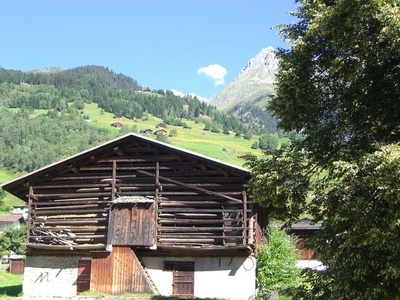 Some of the inhabitants still speak the Romansh languages which is the 4th official language of Switzerland. 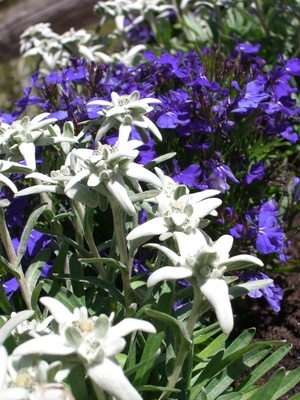 It is based on the Latin mixed with an earlier language - Rhaetien. 60.000 people speak this language. 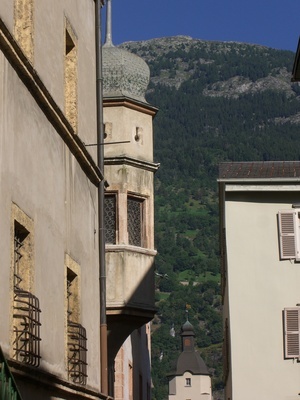 We headed towards the north to Bellinzona the capital of Ticino canton. It took only 24 minutes on the train to get there. Julie, our lecturer gave us a guided tour in the Castelgrande, which is the lowest fortification out of the 3. 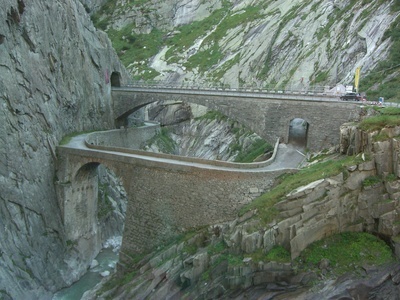 This town was the southern gate of the Gotthard Pass (the valley on the left on the picture) and St. Bernard Pass (the valley on the right). 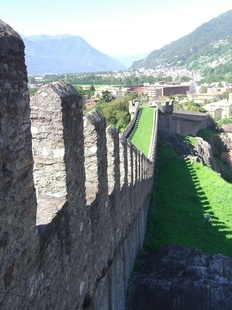 The fortification system of Bellinzona closed down the valley completely. They could control the traffic going through and could collect the taxes. Ticino and Bellinzona was under the supervision of Milan for 400 years. When there was a threat of French control Ticino asked the German speaking canton of Uri to protect them. This meant 300 years of foreign control again. 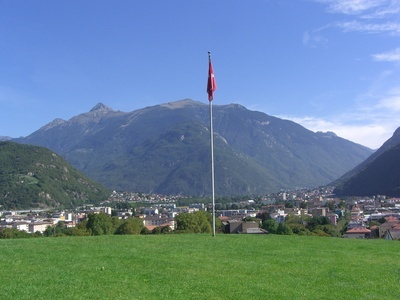 Ticino got canton rights during the time of Napoleon. 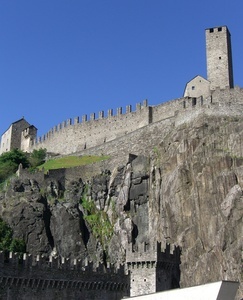 Due to this very special military heritage with the 3 fortification Bellinzona was declared part of the World Heritage in 2000. After the guided tour we had some free time to eat some lunch on our own with our lunch money then we took a postal bus to Pollegio, where the Alptransit Visitor Center is situated. Here we got a presentation about the construction of the new Gotthard Tunnel and visited the small exhibition. The new Gotthard Tunnel will be 57 km long (ca. 34 miles) longest tunnel in the world. They started to work only 10 years ago, the drilling part should be ready by the 15th October, but the first train can cross only in 2017. We returned by bus and train to Locarno for the evening and enjoyed another delicious dinner in Hotel Camelia, which indeed has an excellent restaurant. After dinner we had a possibility to enjoy a Puppet show by a Torino based Marionette group, who performed an 18th century love story along the lake. Perfect finish to our stay in the Italian speaking Ticino. 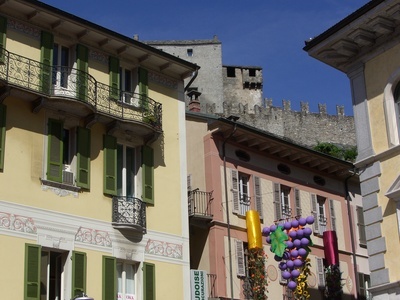 Locarno is situated along Lago Maggiore and it hosts the 3rd most important film festival in Europe at the beginning of August each year. We walked the winding streets of the city and visited some of the pretty churches. One of them was built by a citizen attached to his palace. Then we took a postal bus. Where railroad would not be feasible (remote villages) the Swiss Post is running a postal bus service, which along delivering the mail also transfer people. 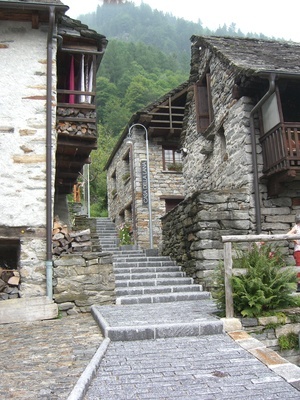 We went up the Verzasca Valley. At the lower part of the valley we have seen a huge dam, what you all know from the Golden Eye movie – this is where the doubler of James Bond jumps off at the beginning of the film. Behind the dam there is a large "lake", further up it gets much smaller and wilder and it is beautifully green. 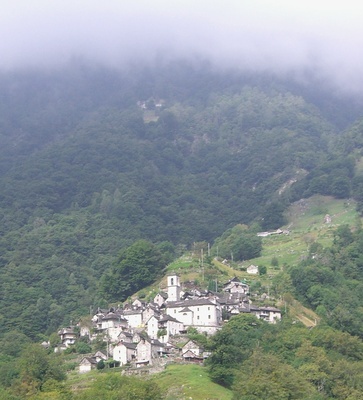 On top of the hill you can see the smallest Swiss settlement which has only 16 inhabitants (Corippo). There is also a double bridge what the locals call a Roman bridge, but it is not that old, was built “only” in the 17th century. At the end of the valley we got out in the pictures village of Sonogno. Used to be a very poor village where at the end of the 19th century little boys were bought by some “businessmen” and taken to Milan to become chimneysweep. 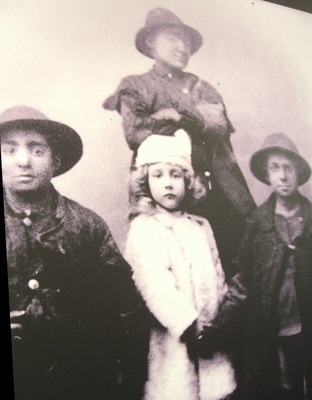 They had to climb in the chimneys which was sometimes still hot and had to work tremendously for very basic food and accommodation. This was the only way to support the large families back in the remote villages. Some of these boys are still alive and we could watch a movie about them telling their stories. There is a novel and a musical about the boys. 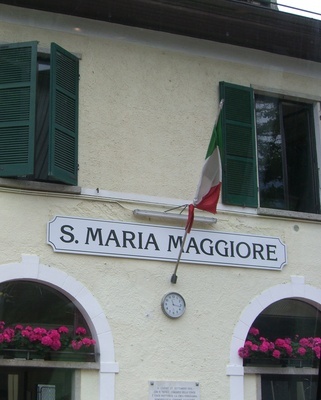 In Ticino it is typical to have small grottos (local restaurants) where only home-made meat, cheese, wine, salami, pickles is served. Today our lunch was also grotto style – local cheese and Merlot wine which is the most typical in Ticino and they also offer white Merlot along with rosé and red. In the evening with some people we went for a night swim in the Lago Maggiore which was accompanied by full moon and some local ducks. This morning we started out on a fast train, which entered right after Brig the Simplon Tunnel. This was the longest tunnel in the world for a long time (ca. 20 km – ca. 12 miles). 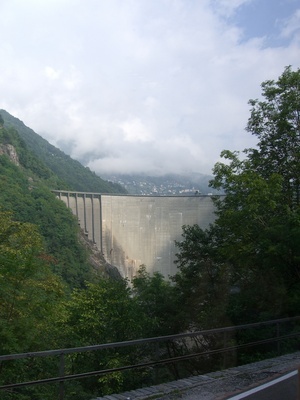 Most of the tunnel is in Italy so once we got out we reached Domodossola in Italy. 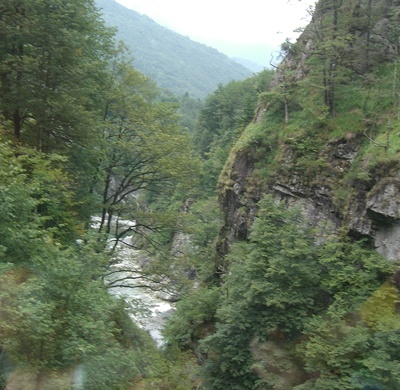 We changed to a panoramic train which took us first up to about 800 m (ca. 2600 ft) along sweet Chestnut trees – which grow everywhere here. This used to be poor men food. You can see one of the Italian train stations. 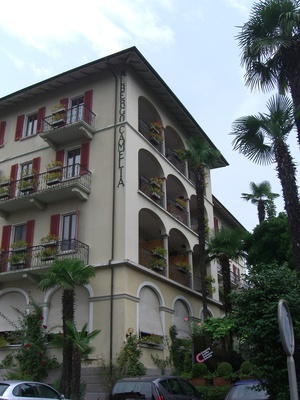 Once we arrived to Locarno, we checked in to Hotel Camelia, where we had a great lunch (actually the restaurant of the hotel is really excellent and the staff is really friendly and helpful). 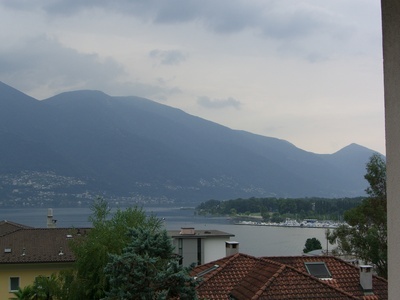 Our hotel has great views on Lago Maggiore. We had a lecture on Ticino Canton by Julie Guidotti, who was born in the USA but lives in Ticino for 20 years. 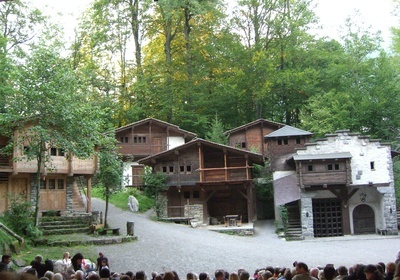 We learned that here in Ticino people speak a local dialect, but they do not write it down just like with Swiss German. They use Italian for the education and media. 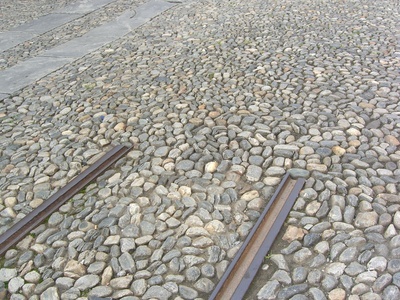 When the train lines were built which connected the villages a so-called train dialect was developed - what everybody could understand. This slowly replaces the village dialects. After the lecture we enjoyed a great dinner and a nice evening in the Mediterranean garden of the hotel among camellias, roses, palm trees and rosemary bushes. On this sunny morning we started with a short lecture about the high mountain passes by Beatrice Wüst. In the middle ages people were “climbing” over the passes of the Alps (pilgrims, merchants even the pope). 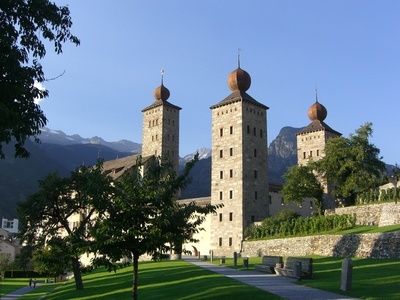 The controller of Simplon Pass was Mr. Stockalper who built the castle in Brig. From Brig to Rome it took 35 days on foot. There were hospices on the way, where the poor got free food and accommodation. Napoleon constructed a road. By 1906 the Simplon tunnel was completed and it was the longest tunnel in the world till the 60’s, although it was nearly blown up by the Germans during WWII. 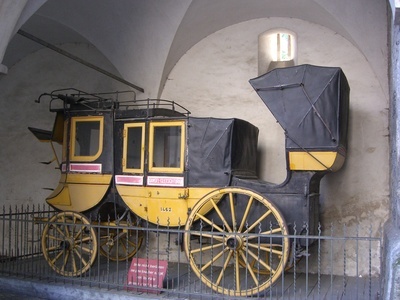 This photo is from an old post carriage from the Stockalper castle. After the introduction we went for a guided tour in the Stockalper Castle which was the largest private castle. He was obsessed with the nr 3, his castle had 3 towers, 3 sections and he also said the ideal life should have 3 parts: 30 years of education, 30 years of work then 30 year of retirement. He had a long life, so he could fulfill this in the 17th century. 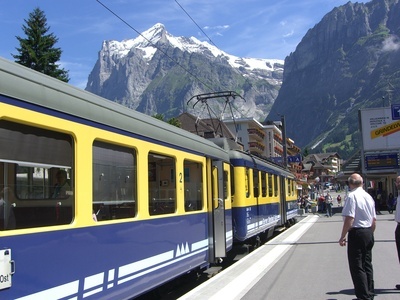 We got on a train to Zermatt, which is one of the oldest and most elegant mountain resorts. 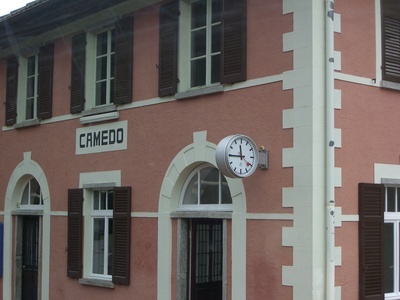 If you are arriving by car you need to leave your car in the previous village and take a train. In Zermatt there are only horse drawn carriages and electric cars to keep the air clear. 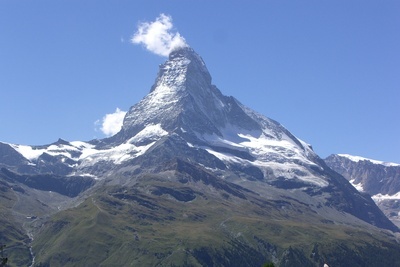 The most famous sight of Zermatt is the Matterhorn (4478 m – ca. 15000), which is not the highest mountain in Switzerland, but since it has a very characteristic shape, many people wanted to climb it. You can find the graves of some of the unlucky climbers in the local cemetery. We took an underground funicular to the Sunnegga (2288 m – ca. 7550 ft). Once we got up there we had an amazing view of the Matterhorn. Tonight we tasted a local specialty Cholera – a pastry filled with potatoes, apples, cheese and onion. It was delicious! We also had a story telling evening tonight with Beatrice. This morning our luggage was loaded into the van of Victor, who delivered it for us to our next location. We travel to Zweisimmen first where we got on 2 minibuses, which took us up on this one lane road to 1550 m (ca. 5000 feet) to a family run Alp. 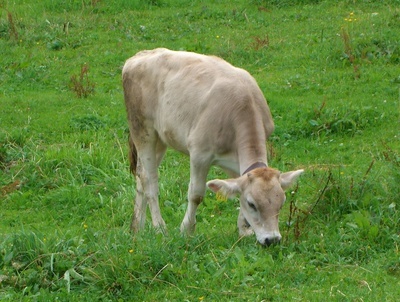 An alp is a place where the cows spend 3-4 months with grazing during the summer and the owners can produce cheese and other dairy products in the meantime. T his is a large alp with around 80-90 cows. They handle ca. 1200-2000 liter milk twice a day and they produce each day 8 big cheese (ca. 10 kilos/cheese – 20 pounds) and some smaller cheese, yoghurt and butter. After adding the bacteria to the milk and warming it, they press out the liquid, then they soak the cheese for 24 hours in salty water. The small cheese goes to the cellar for 2 months the big one at least for 6 months. They need to be brushed off with some water nearly each day. 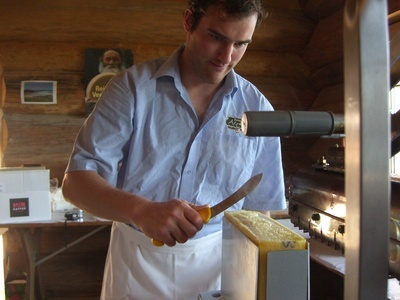 We tasted some fresh cheese some 2-3 year old one as well and they were really different but all delicious. For lunch we had Raclette, this is also a locally made cheese, which melts easily. Under this special “oven” it melted and the “cheese maker” cut off the melted part for us. We ate some boiled potatoes and pickles with it. It was delicious. After this fun experience we had some time for a short walk to enjoy the magnificent view. 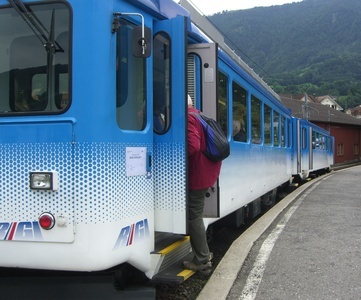 In Zweisimmen we took the so called Golden Pass line to Montreux. Beautiful ride in the special cars with large windows even on the ceiling. We reached the French speaking territories and even the architecture changed. 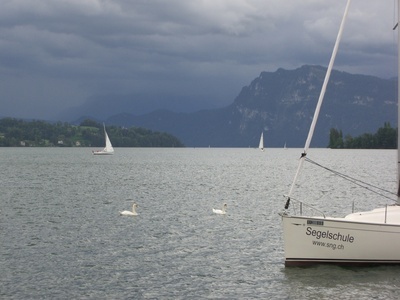 We descended to Lake Geneva and spent a short time on the “Swiss Riviera”. In Montreux we also said good bye to our wonderful Rauati and we meet our new “assistant” Fabienne. From here we followed the Rhone River valley which is a really fertile area with wonderful wine terraces and orchards along the way. We arrived to Brig in the evening which is a beautiful town – we will spend 2 nights here in the Schlosshotel – charming spot. After a great introduction to Bern in our classroom we headed out to the capital of Switzerland. Bern used to be a strong military power and its name literally means bear. This was the busiest city on our itinerary so far, but still not too bad. 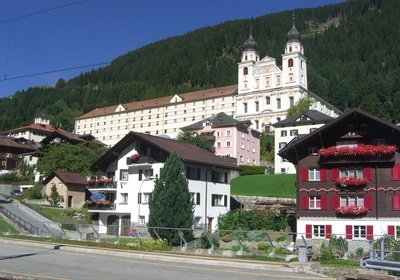 The beautiful old town is situated on a high peninsula surrounded by the amazingly green Aare river. There are 4 parallel streets each decorated with fountains. On top of each fountain there are fantastic decorations, the most famous being the child eating ogre. 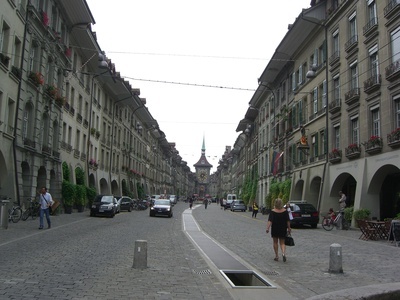 You can drink from all of the fountains in Switzerland, unless otherwise marked! We visited the Münster (we could call it the protestant cathedral) which is really breathtaking, then we had free time. Andrea provided us with lunch money, so everybody could decided where to eat. This worked out great. 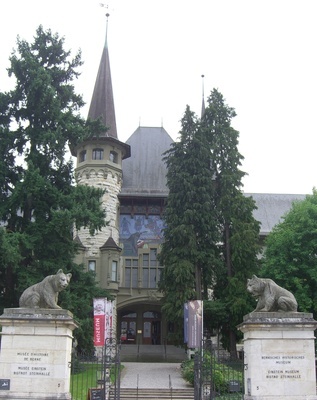 There are several museums in Bern. I visited the History Museum, where they have a great exhibition about Albert Einstein, who used to work here. The city also have a Paul Klee Center in a residential area. It was wonderful to have a museum pass included in our train pass. very Swiss today. 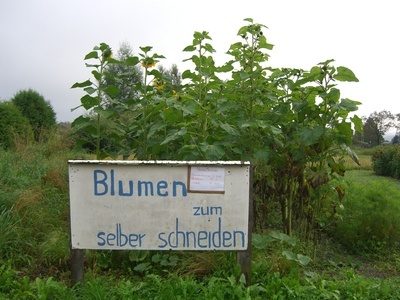 Walking across open gardens in Interlaken, I encountered a sign that you can cut flowers in a field and put the money in a sack on voluntary bases. Our local guide commented that years ago these sacks were not locked; now they are, but still – I can not imagine this system of selling flowers would work anywhere else in the world. Since this was our last evening in Interlaken I went for a short walk. It was amazing to see the in most of the souvenir shops – selling Swiss army knives, cuckoo clocks and Swiss watches the shopkeepers are actually from Asia. 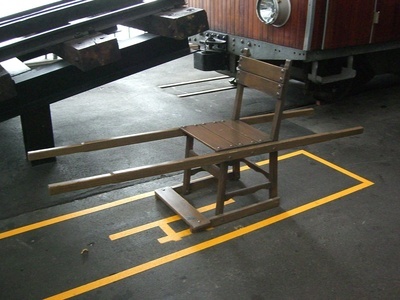 There are many Japanese tourists in Interlaken, I assume this created this surprising situation. 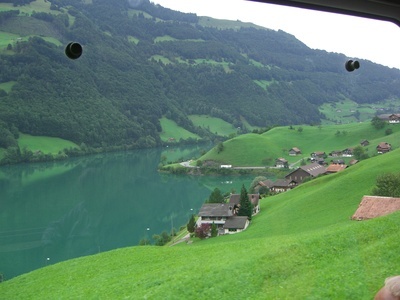 We started our train ride from Interlaken Ost to Grindelwald (34 min – ca. 1090 m, 3600 ft). Here we went to visit a local public school. You can see the school right under the 4000 m (ca. 13000 ft) high mountains. 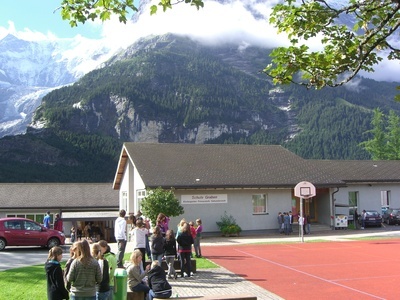 We got an orientation about the Bernese School system – education is organized on Canton level. 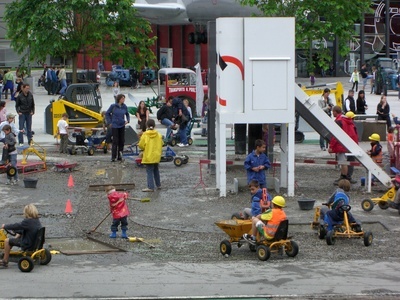 The most impressive part of the Swiss education is the apprenticeship program. Every student has to work as an apprentice – this is compulsory in all of Switzerland. The language of instruction is high German – students study that as a foreign language from 1st grade, then they study French and English as well. The education is free of charge, you need to pay a fee only for the university (ca. 700 Swiss Franc/semester). A young teacher earns around 5500 CHF/months – 13 times a year. After lunch we got on a train to go up to Kleine Scheidegg (33 min, ca. 2061 m, 6800 ft). From here trains are going up to Jungfraujoch the highest train station in Europe (3454 m, 11400 ft). Since we had a beautiful sunny weather 2 of our participants took the option to go up and they enjoyed it tremendously. 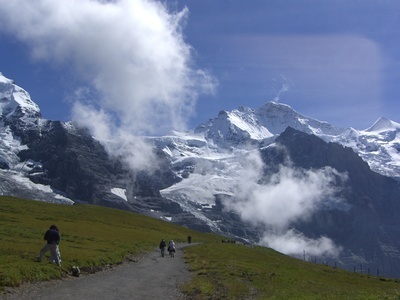 The rest of the group walked a little at the foot of the 3 giants (Eiger, Mönch, Jungfrau – all free mountains are around 4000 m – 13000 feet high). 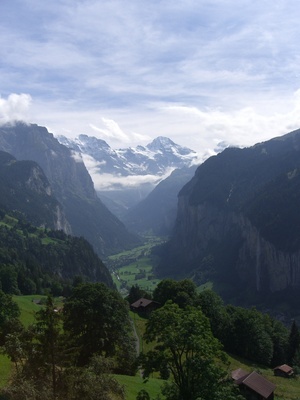 Then we took the other route down through Lauterbrunnen. This valley resembles very much the Yosemite Valley – it was carved out by a glacier you can tell it by its U shape. Today Andrea gave a lecture on the health care system, while we checked it out in practice with one of the participants – nothing serious. We went to the doctor’s office, which was very impressive. At the train station of Lucerne there is a 24 hour service, well equipped, with the usual Swiss efficiency. 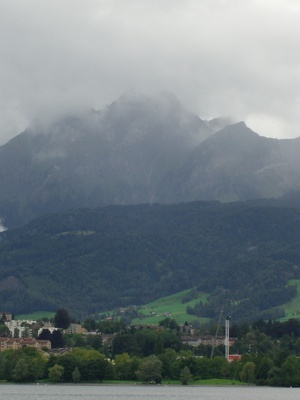 Then we said good bye to Lucerne and started towards Interlaken. You can see our view from the train window on the first picture. 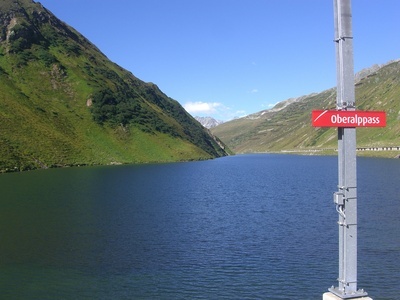 The train lowered its cogwheels to climb up to the Brünig Pass, then we descended to Brienz lake and change direction in Meiringen. This town has the fame to produce the first meringue! In Brienz the train stopped for 4 minutes only. We had well organized teams to unload our luggage what only took I would say less than 2 minutes. As you can see some participants followed closely the route we were taking. 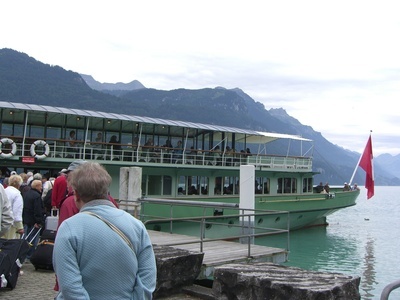 We got into a historic paddle steamer to cross the lake from Brienz to Interlaken. On our way we have seen a large waterfall. 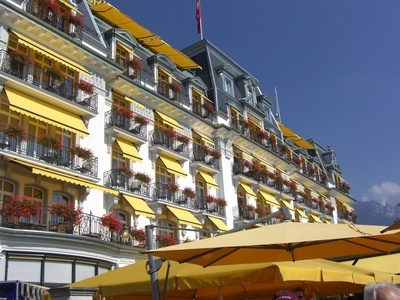 Interlaken is situated between 2 lakes on the Aare River. From the train station we walked through the center of town. In Hotel Artos (www.artos-hotel.com) we were welcomed by local wine and introduction by a hotel representative to the facilities of the hotel. It is run by the Methodist Church and along a very nice modern hotel they also have a senior center incorporated in the building. Very friendly and welcoming atmosphere with great service and free wellness facilities. We had a lecture on the Alps and we learned that the Matternhorn (one of the symbols of Switzerland) was formed from the African tectonical plate, so there is a piece of Africa on the top of Switzerland. Today we started with a history lecture which gave us a great background how the cantons have formed Switzerland and how is the political system structured. It is quite exciting that the politicians are only part time politicians, the parliament is in session only for 12 weeks and during the rest of the year they get back to their regular jobs. Then we had a short city walk to explore the famous lion monument – according to Mark Twain this is the most moving piece of stone in the world. Then we crossed the Chapel bridge which was build in the 14th century painted with frescos in the 16th century then burned down in 1993. It has been reconstructed mostly but there are still some black panels. 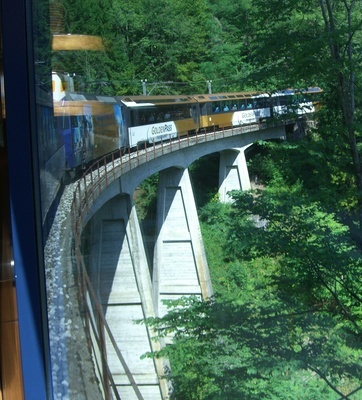 After a nice lunch in Hotel des Alpes at the foot of the Chapel bridge we got on a train to Arth Goldau (26 min). 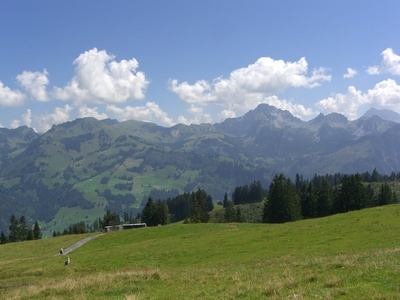 Then we took the Cog-railway – the blue one - up to 1500 m (4500 ft) elevation to Mt Rigi (25 min). Along our way we had waterfalls one after the other on one side we could see the cities and the valleys like miniature settlements for dolls. Then we took the red Rigi train down to Vitznau (25 min). Once down there we could see how they turn the engines on a turn table. 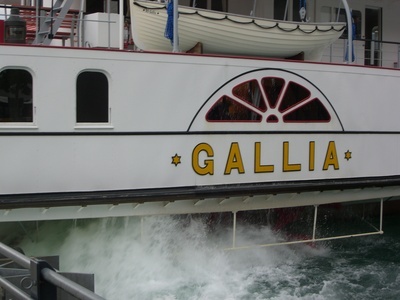 Then a short boat ride across Lake Lucerne (15 min) to catch the Paddle steamer Gallia, which was absolutely beautiful. 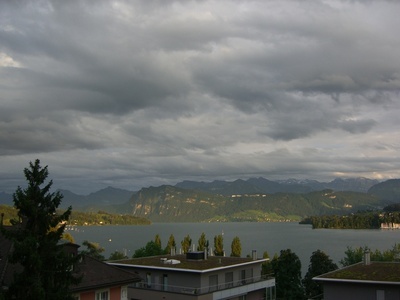 During the 75 min cruise back to Lucerne we enjoyed our dinner in the first class salon restaurant and the marvelous view. 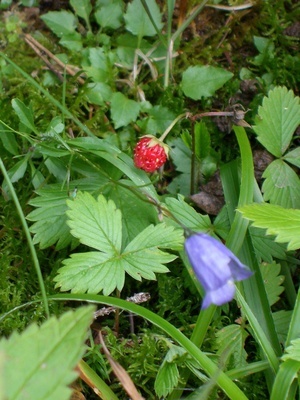 Instead here is a strawberry picture - our path was "paved" with wild strawberries and raspberries! This morning we started with two great lectures by Mr. Peter W. Frey, who is a journalist writing for the Tages Anzeige. First he covered the language and religious diversity of Switzerland then he explained us the reasons how Switzerland along with Japan developed a public transport system, where you do not want to drive a car. Trains are running every hour to major cities and in rush hour sometimes every 15 minutes. We had a local lunch in the cafeteria (a kind of Swiss macaroni and cheese adding some potatoes as well). Then we explored the museum. Airplanes, trucks, cars, ships, submarines and of course trains. 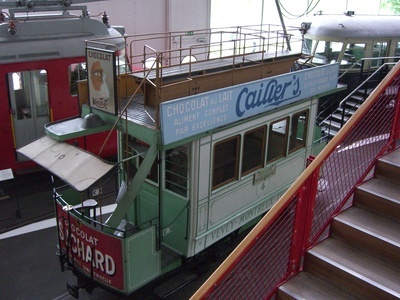 We also saw this lovely “tram” which was used to take around tourists at the end of the 19th century. 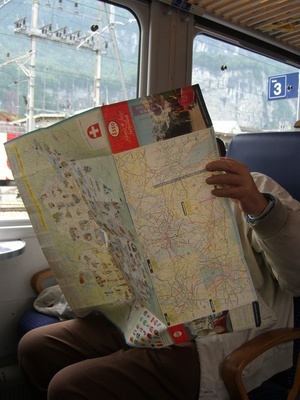 No surprise everybody included Switzerland on the Grand European itinerary! My favorite part was really all the kids activities. Although it was raining you can see how eagerly all these young constructors are fixing up the road! 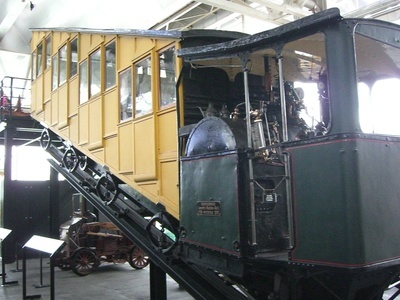 The uniqueness of our journey is that we use only public transport to get around, so we all have a 2 weeks rail pass, which covers not only the extensive railroads of Switzerland but also most of the city buses, and gives us free entry to the museums as well. Our group of 26 people arrived on 10 different flights so we split up into 3 groups to minimize waiting time – first group was taken by Andrea, second by me and the 3rd by Rauati, the lovely assistant of Andrea. 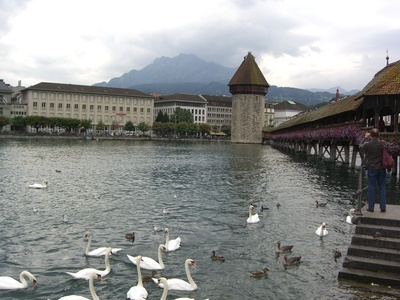 It took only 1 hour on a direct train to reach the center of Lucerne, and once we left the train, Victor took our luggage to the hotel and we got on a local bus – which was quite unusual looking. In addition to double length city bus it had a separate “carriage” attached to it so it was like a triple bus! Swiss do everything a little differently. 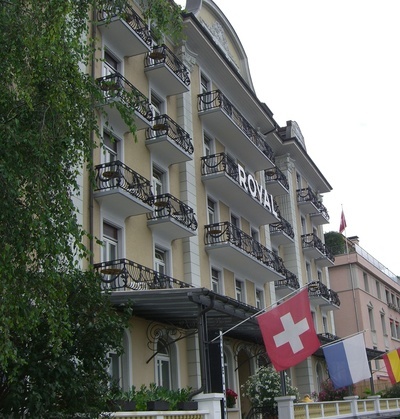 Our hotel (Hotel Royal) is situated in a hilly part of Lucerne just above the Casino. You can see some photos of the hotel and the view from the terrace, which is really breathtaking. It is run by a family, and they do a great job, everybody is really friendly and for our group they also offer meals what is delicious. Lucerne is as beautiful as ever. High mountains surrounding a four-leaf clover shaped lake and as a crown on all these beauty, you find the lovely old town of Lucerne. It is so relaxed and so accessible on foot, that you just feel at home right away.